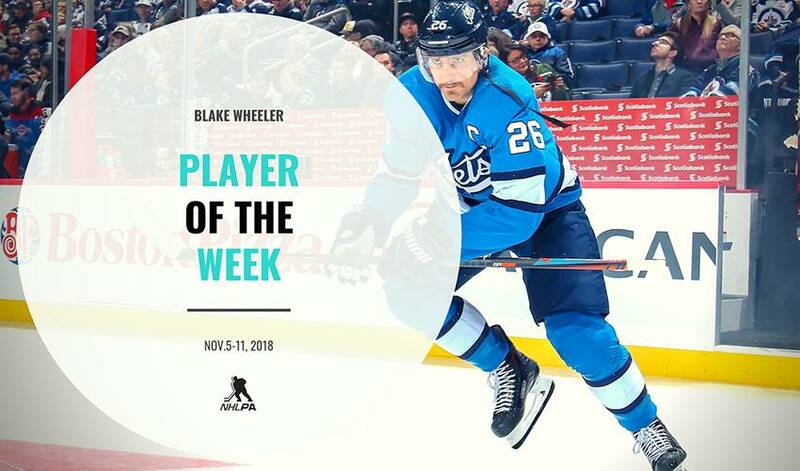 A career-first, a franchise-first, and a hot streak that just keeps giving – Blake Wheeler needed just two games to find himself co-leading the league in assists with a seven-point week. Wheeler (3-20–23), who hasn't been held off the scoresheet since Oct. 16, surpassed two impressive scoring benchmarks (400 assists and 500 points) and currently leads the Winnipeg Jets in assists and points. Wheeler carried an eight-game point streak into Friday night's matchup against the visiting Colorado Avalanche, as the Jets returned home from their two-game trip in Finland. He had a hand in each goal in Winnipeg's eventual 5-2 win by notching four assists before adding an empty-net goal for his third of the season. While a five-point NHL outing was a career-first for Wheeler, a dazzling display of skill led to his third point of the night – the primary assist on Nikolaj Ehler's game-winning goal – and also stood for his 400th helper in the league. True to form, the Jets captain passed the praise along to his teammates. "Well, the weapons we have are pretty special," Wheeler said postgame. "I'm the guy getting them the puck. They make the passer look good. The guys that shoot like [Mark Scheifele] and [Patrik Laine] are incredibly rare. And you stack them up on one power play, it's really hard to stop that." Wheeler earned the game's first star alongside additional praise from Jets head coach Paul Maurice. "Anything that's truly elite, I don't think you have an answer for. I can't tell you how Patrik Laine shoots the puck. Blake has been an elite passer, and what I find makes him unusual is that, for the most part, he can make those passes at speed." Sunday night marked the second 5-2 win of the week for the Jets, with the New Jersey Devils visiting Bell MTS Place. Though Jack Roslovic's opening goal for Winnipeg meant the end of an impressive run for Wheeler (the 32-year-old factored on ten straight goals to become the 12th player to accomplish such a feat) he tallied two assists to become the first in Jets history to reach and surpass 500 points since the club's relocation from Atlanta. The multi-point outing was Wheeler's fourth in a row and extended his overall point-streak to 10 games. The Jets continue with home-ice advantage and play host to the reigning Stanley Cup Champion Washington Capitals Wednesday night at 8 p.m. ET.